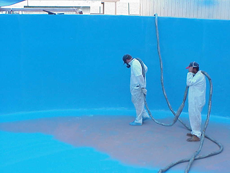 Arizona Specialty Coatings (ASC), we specialize in the application of polyurea and polyurethane coatings. We understand that our quality starts with the selection of first-class materials. 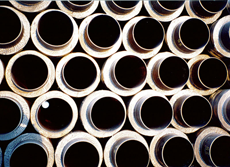 We carefully select our suppliers from only the leading manufacturers of coating technology. With a broad range of polyurethane and polyurea formulations at our disposal, we are able to match the characteristics of the material to any customer requirement, from extreme surface hardness to hyper- flexibility. Polyurethane and polyurea are among the most advanced coating technologies in the market today. Best known for physical properties such as, fast cure time, superior elongation, high tensile strength, abrasion & impact resistance and impermeability, polyurea creates a tough coating that protects valuable assets better than any conventional coating method. With a reaction time of 5-15 seconds, polyurea coatings cure > 15x faster than traditional epoxy coatings allowing important facilities or equipment to be quickly returned to service. The same unique fast reaction time prevents polyurea from reacting to surface moisture or temperature and as a result can be readily applied in harsh ambient environments to substrates such as, steel, concrete, aluminum, fiberglass or wood. Flat surfaces to the most complex surface structures can be consistently coated with polyurea from any direction, including overhead, with exceptional adhesive properties. emissions or production environments sensitive to outgassing. The markets for polyurethane and polyurea are unlimited and new applications are being discovered every day. Polyurethane and polyurea are not terms that describe one coating with a single set of specifications. There are numerous formulations, with unique characteristics, advantages and disadvantages. It pays to retain coating specialists such as Arizona Specialty Coatings to guide you through the appropriate material selection, surface preparation and application process. Improper materials, preparation and/or application can not only cost significant time and money to repair but, can also present serious safety risks. Let the Arizona Specialty Coatings team do it right the first time. 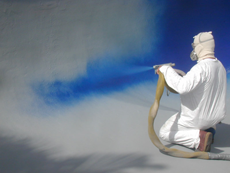 Arizona Specialty Coatings includes a highly-trained team of applicators, project managers and spray coating experts that work closely with customers on a case-by-case basis for individualized solutions. We carefully analyze your specific needs, environmental concerns and aesthetics to recommend the appropriate course of action to deliver a high-quality coating that will extend the lifetime of your assets. Arizona Specialty Coatings ensures that safety procedures and government regulatory guidelines are observed and built into every project plan. Our environmentally-friendly products have zero VOCs and are considered a safe solution for nearly every industry. Arizona Specialty Coatings can perform in-field applications or where necessary assets can be coated in-house at our local factory. As with any coating technology, quality equipment is imperative. Our professionals are equipped with the latest spray technology to ensure the exact mix of products and excellent uniform coverage — guaranteed. Reduces risk of damage due to tears, scraping ect.